Carl Eschenbach (President & COO) opens proceedings with a few minutes recapping the Liquid World and Brave New IT themes from yesterday’s keynote. First up Carl introduces Martin Heisig from SAP for a bit of a Chinwag™. They run over 70,000 VMs with a virtualisation rate of over 85%. A key use case for SAP is the 20,000 training users who have access to an on-demand training platform, bringing up and tearing down VMs constantly. Similarly their dev environment, referred to as “The Zoo”, consists of over 30,000 VMs. SAP have reduced deployment times for new platforms from 72 hours to 30 mins, sometimes rebuilding all 30,000 machines in the space of only a month. As Dave Simpson tweeted, “that’s some big numbers right there”! Of course most customers are nowhere near this size, but it definitely gives you ideas as to the kind of things achievable on the platform. SAP recently certified SAP HANA on vSphere with up to 1TB of RAM. That’s pretty decent scale! Martin mentions vCloud Air in passing. I wonder how long it will be before we get HANAaaS on vCloud Air? Vodafone’s Tom Stockwell (Head of Hosting Product Management) represents the next customer use case, with their new Hybrid Cloud solution for Enterprises. Vodafone chose VMware in part due to the user community supporting their software. The acquisitive VMware strategy with companies like Nicira and Dynamic Ops was also a key element. Their hybrid platform is based on a number of technologies including NSX, vCD and VCAC. Summarising the last 30 minutes, Carl states that the SDDC is the Architecture for the Hybrid Cloud. Next on stage is Raghu Raghuram (Executive VP, SDDC). He starts by a current status on VSAN, NSX and vRealize Suite. All you need is a bunch of commodity servers now, and you “pour” the VMware management software on top. Raghu invites “Chief Powerpoint Officer” Ben Fathi (CTO) on stage to talk about EVO:RAIL and it’s 15 minute deployment time. For more info on EVO:RAIL see my previous post with links to loads of great official and community content. He goes on to talk about EVO:RACK which includes the entire vCloud Suite, VSAN and NSX included, and has a build time from about 2 hours. Raghu now addresses the subject of vendor lock in, with VMware’s answer being the use of VIO (VMware Integrated OpenStack). Ben demos how VIO deployment is integrated into the vSphere Web Client, which lets you manage all the common operational elements for OpenStack (e.g. Nova, Glance etc). The integration with vRealize Operations Manager looks pretty cool, letting you drill down into the tenants on the OpenStack platform, among other things. Raghu then starts to discuss some of the vSphere Beta improvements, starting with SMPFT. This allows you to protect VMs with up to 4vCPUs. This will be great for highly critical services which may not have application layer HA. The element many people would want to protect most is vCenter, but I have heard mixed messaging as to whether this is actually recommended. VMware have some announcements coming around providing HA for vCenter (potentially natively). Ben’s is back on the Powerpoint clicker, talking about Cloud-Native Applications, typically fault tolerant applications built across containers. Docker augmented the standard Linux LXC container with a simplified interface for building, deploying and transporting these containers. VMware believe you can get the best of both worlds running containers inside VMs, so you can augment your platforms with the flexibility of the VMware ecosystem around things like isolation, ops management, SDN through NSX, etc. VMware have also been working with Google to ensure Kubernetes integration with VMware. VMware have published a blog this morning comparing containers on bare metal vs using VMware and found the typical overhead to be 3% or less. vRealize Code Stream is designed to help with the release process from dev to prod. Ben demos vRealize Automation’s “Release Automation” feature which lets you drill into a pipeline of functional testing, system integration testing, staging and prod, and the results for each stage of the development lifecycle. Automation as a Service (vRealize Air Automation) and Compliance as a Service (vRealize Air Compliance) are now available to provide services across multiple clouds, including AWS. These are the first two in what will be a series of SaaS offerings under the vRealize banner. Next, Policy Management, and a demo on the vRealize Automation Center. A set of networking, security and storage policies have been associated to a demo application. Based on the attachment of the policy blueprints, the VMs under the application will be remediated to meet the applied policy. An example of this would be to apply a Silver storage policy which happens to have a certain performance profile and a number of failures to tolerate (how many copies of the data on VSAN). Once these policies are in place (which will take some work in your environment to define), you can simply then assign apps and VMs to policies, and consumers don’t need to worry about the details on how this works. NSX Microsegmentation is covered next. This is a brilliant technology as it allows you to effectively firewall VMs within the same security zone. Working for a service provider, this opens up many more options on how we architect multitenant and public cloud solutions. It’s definitely a driver for NSX adoption, even if you ignore all of the other features! Simone Brunozzi (VP and Chief Technologist, Hybrid Cloud) comes on to demo an interesting use of APIs; sending alerts to Google Glass! He then demos extending an application out into vCloud Air. This was done by extending the L2 network out to vCloud Air using VXLAN and NSX. Simone confirms that one of the most popular vCloud Air products today is DR-as-a-Service, based on vSphere Replication. So overall, no real announcements in todays keynote, mainly just reiteration of messaging and focus on demoing the path from a standard virtual platform, to an automated, orchestrated SDDC, with vCloud Air burstability and DR! If you have time to, and want to see these demos, I would recommend watching the keynote replay and jumping to about 30 minutes-ish, when this section starts. When I got approval to come to VMworld Europe, I set myself a couple of challenges; one of those was to try to blog the key note. This is my attempt! The keynote opens with a quote from Arthur C Clarke followed by some fighty/dancy people… (sigh) I still genuinely don’t get this phenomenon at tech conferences! Maurizio Carli, Senior VP and GM for EMEA confirms we have around 9,000 people at the conference today, continuing to increase year on year (2013 attendance was approx 8500 if my sources are correct!). Even with many EU economies struggling at the moment, to still be increasing attendee numbers is a really positive sign. Maurizio draws comparisons between the fact that Gaudi had no limits, and us exploring the possibilities of technology and expanding our knowledge and expertise, No Limits being the theme for this year’s VMworld event. 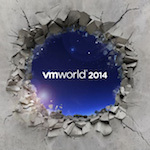 The strategic priorities for VMware in the next year will be SDDC, Hybrid Cloud and EUC. We wonder if the latter refers to the year of VDI, but Maurizio is actually referring to the recent purchase of AirWatch. Phew, that was close! A quick reminder to sign up to your local VMUG. I would echo that, the London VMUG has been an amazing way for me to meet like minded individuals. The VMware foundation is collecting money this year for the 5 causes of Children, Education, Environment, Women & Girls and Human Rights. Go down to the hang space to throw your own paper aeroplane and raise money for these charities. The further they go, the more money the charities will receive! Maurizio introduces Pat Gelsinger and reminds us of the endless possibilities, a key theme for this year’s VMworld. Pat starts by drawing comparisons between the tech world and water, the fluidity and constant, accelerating change. He discusses examples of the challenges of some of VMware’s big name customers such as Cancer Research UK, Lufthansa, Ministry of Education in Malaysia, most interestingly pushing 25,000 virtual desktops to 1200 schools in 5 months, many of which as being accessed from remote locations. The courage theme from VMworld SFO seems to be in effect again at VMworld EU, talking about how we need to be brave in IT. Several customers were asked to stand up for congratulations on their bravery, none of whom looked particularly comfortable! Pat challenges the crowd to “Go Bravely” to, not risk taking but being bold in decision making. When it comes to SDDC, Pat says VMware will not be done until every customer is 100% virtualised, a challenge indeed; I suspect we will get close within the next few years but some of the newer scale-out technologies are definitely challenging this paradigm. Federation SDDC solution (with EMC and Pivotal). Hyper-converged infrastructure was next up, with a reiteration of the EVO messaging from SFO. Then the anticipated announcement that HP will indeed be providing an EVO:RAIL appliance, along with HDS. HP was starkly missing from the SFO announcement, and generated some buzz as to whether there was a specific reason behind this, as opposed to just not being ready yet. Definitely worth checking out the EVO Zone if you are at the event this week; interestingly the HP EVO appliance is sitting front and centre of the floor. I guess as they sell over 50% of all servers on the planet, it’s probably important to give them a good space! From an EVO:RACK perspective, VMware are contributing to the OCP (Open Compute) project. Not a huge amount of details on this yet though. Next, announcement that VMware Integrated OpenStack is now in Beta. They already have one customer announcing their own stack based on this, CSC. Pat reminds everyone that containers are a very fast growing sector. The SFO announcement always reminds me of the Scotland No Campaign “Better Together”. I bet the marketing folks were so happy about that! With Docker, Google, Pivotal, VMware announce a common platform for container, Project Fargo, to provide “Containers without Compromise”. Again, not much detail, but I’m sure there will be plenty on the blogosphere to consume imminently! NSX is up next. Pat asks if we have VMs (Virtual Machines), why not VNs (Virtual Networks). I’m sure that’s not going to get confusing on conference calls… the partnership list is growing on NSX though, adding to the existing line up of companies like F5, is Palo Alto Networks. Bringing the distributed firewall functionality with PA security tech not only on premises, but available on vCloud Air too. Microsegmentation on NSX (the ability to create firewall rules within zones, not just between zones) is a very useful feature for hardening your core application platforms, and something which may help to drive customer adoption. It’s certainly a lot more flexible than using Isolated PVLANs. In the very short nod to EUC, we’re reminded of the Cloud Volumes procurement. All of the EUC products / components are coming together with the “Workspace Suite”. Finally we come to Hybrid Cloud, and as the slide says, “The Future is Hybrid”. There will be a tight integration between vCloud Air and EVO:RAIL, enabling integrated access to vCloud Air services from EVO:RAIL, including DRaaS credits bundled with your EVO:RAIL appliance [“for free?”]. What a great way to encourage customers to use DR, and at the same time encourage them onto VMware’s own platform, making them extra sticky! That’s it from Pat, who then introduces Bill Fathers (Executive VP and GM for Hybrid Cloud). From 2009 to 2014 the rate of public cloud adoption for VMs has only gone from 2% to 6%, despite all the hype. VMware believes companies are now moving from the “Experimental” phase, into the “Professional” phase, with an explosion in public cloud adoption imminent. Bill says “For someone who is British, this is about as excited as I get!”. Bill asks why some customers are stuck in the Experimental phase? Developers are spreading out across multiple public clouds; the security, governance, performance and costs concerns are significant; all of this generates an ever increasing size of footprint to manage and protect. As this happens, Lines of Business become more and more independent, developing apps which are entirely silo’d from your primary platforms. VMware believe the way to drive this forward is by adopting a hybrid strategy, with a hybrid platform for consistency across all your environments, and putting the IT Professionals back in charge of making compute strategy decisions. This way the people who are actually accountable for these platforms are the same ones who actually make strategic decisions around what to use! The ability to move workloads between your private and public clouds is seen as the answer to this problem by VMware. vCloud Air being the solution, as it is based on the same technology (vSphere) both on and off premises. This significantly simplifies workload migration. On average since launch, a new vCloud Air location has gone online at a rate of one per month, the latest being Germany. Germany + UK will be the main locations for servicing the EU market. Mobility services including AIrWatch MDM platform available on vCloud Air, as well as Pivotal Cloud Foundry. Ben mentions that the VMworld app has been running on the vCloud Air platform. vRealize Air Automation, offering the vRealize suite as a SaaS offering on vCloud Air. The latest announcement for vCloud air is VMware’s Virtual Private Cloud OnDemand service, based on monthly billing with pay-per-minute granularity. For more info go to www.vmware.com/go/ondemand. From 17th November this will be available in the US and EMEA. From a compliance perspective, the vCloud Air platform is fully complaint with many major compliance requirements, such as PCI-DSS. Lastly, Bill introduces Sanjay Poonen (Exec VP and GM, EUC). Real-time app delivery, with Just-in-time desktops based on Cloud Volumes, which works on both VMware and Citrix desktop environment. NVIDIA Grid Virtual GPU Platform – Working with Google and Nvidia to provide a better 3D experience for remote desktop access, including via ChromeBook. The newest announcement is Horizon Flex, combining tech from Fusion and Mirage with AirWatch to launch secure containers for offline access to a desktop; designed for “Road Warriors”. Next up is announcement of a new partnership with HP and AirWatch. To finish up, Sanjay introduces Kit Colbert (CTO EUC) who does a demo of the use of a combination of the VMware EUC products on a variety of devices. Overall it was definitely an interesting keynote, but I have to say I’m slightly disappointed with the lack of major announcements. For me, the anecdotes and the partnership announcements were probably most interesting. HP joining the list of EVO:RAIL partners, and Palo Alto firewall functionality for NSX will make a number of customers very happy indeed!